Project Brief: Harvest Print & Marketing Solutions is a print shop in Tallahassee that provides print materials and marketing to local businesses. Harvest Print started in 1985 as a small, hometown print shop in Tallahassee. Today, it’s grown into a full-service printing company with a wide array of services for businesses. We met with Harvest Print because they were having a tough time finding a quality web designer in Tallahassee. They also had a website that was over 10 years old. Our team at Web Centre immediately knew that meant two things: 1 – They needed great service and 2 – They were in desperate need of a new, modern website! So, we of course gave them both of those things. 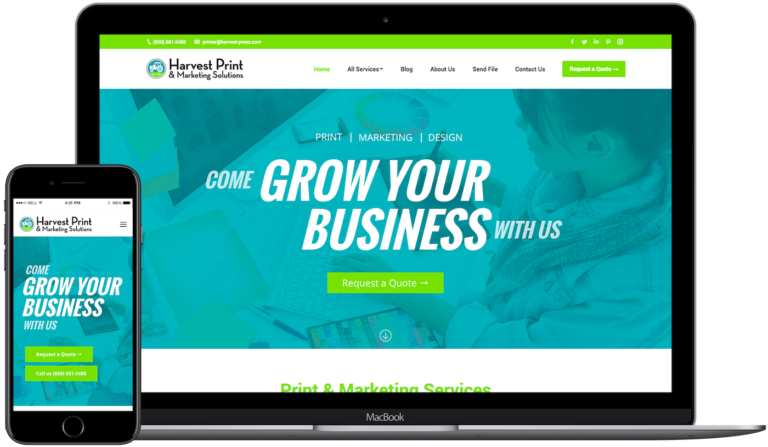 Web Centre designed a brand-new, mobile-friendly website for Harvest Print in Tallahassee. We also want their business to continue to grow and prosper in the area so one of the biggest features their website comes equipped with is a quote form. Customers can submit the project they have to Harvest Print and then Harvest Print gets that lead and can quote their customers fast. The best thing the team can do at Web Centre is to help a business make sales or get leads online. This website does exactly that. Then we extended features beyond that, adding a way for customers to submit their files for print via the website. That way Harvest Print has everything they need submitted to them – all through the website. Get Your Web Design Project Started Now!